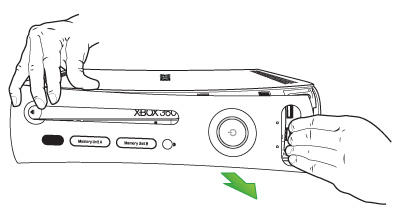 This page describes how to manually eject the disc tray from your Xbox 360 console when the eject button doesn’t work. Follow the step-by-step instructions below. 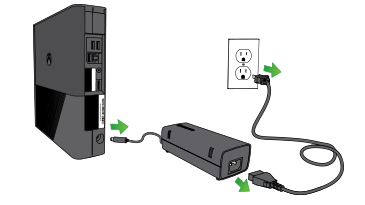 Disconnect the power cord and any other cables connected to the console. Position the console horizontally, as you would position a DVD player. Find the yellow sticker behind the vents on the left side of the console. Insert the straight end of the paper clip into the eject hole, which is located in the centre of the yellow sticker (as shown in the picture below). The disc tray should pop out slightly. Pull the tray out the rest of the way with your fingers. Note If a disc is in the tray, make sure that it is not sticky and does not have a label that might prevent the tray from opening again in the future. Watch a video to learn how to do this, or follow the step-by-step instructions below. Insert the straight end of the paper clip into the eject hole, which is located just above the centre of the yellow sticker (as shown in the picture below). 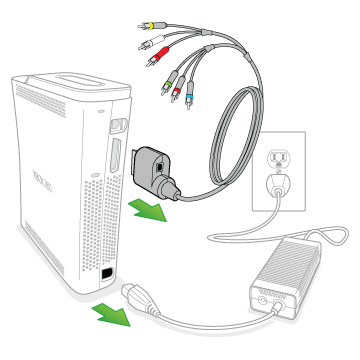 Unplug the power and A/V cables from the back of your console. Position your console horizontally, as you would position a DVD player. 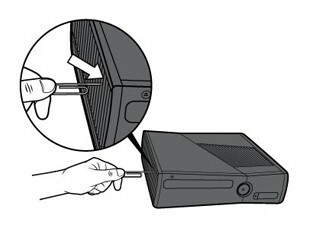 While holding your console firmly, push the faceplate away from the console with your thumbs. Note You will need to use some force to remove the faceplate. 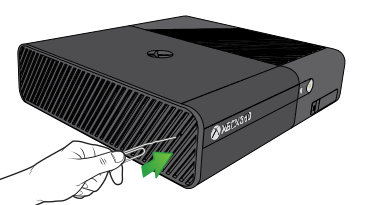 If your console has a hole below the right side of the disc drive, insert the straight end of the paper clip into the hole as shown in the picture below. 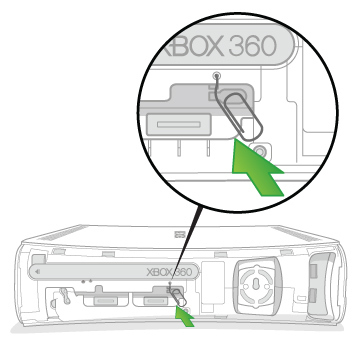 If your console does not have the hole pictured below, skip to step 5. 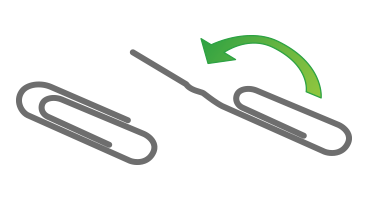 Push the paper clip until you feel some resistance (about 1 inch or 2.5 cm into the hole). If you’re successful, the disc tray will pop out slightly. Pull the tray out the rest of the way with your fingers and skip to step 9. If the disc tray does not open, try the next step. 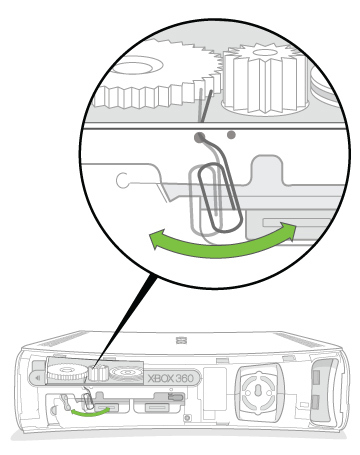 Find the two holes below the left side of the disc drive, and insert the paper clip into the hole on the left. Note Make sure you are pushing the gear mechanism and not the metal plate. If you’re successful, the disc tray will pop out slightly. Pull the tray out the rest of the way with your fingers and skip to step 9. 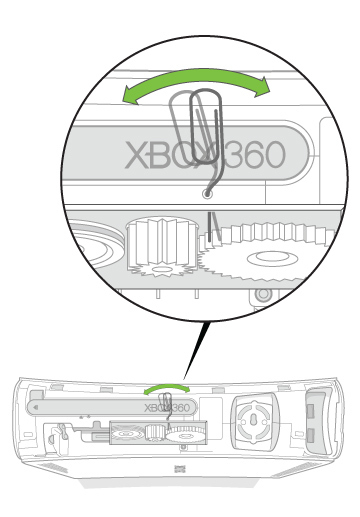 If the disc drive is still stuck closed, insert the paper clip into the adjacent hole (to the right) and push again. If you’re successful, the disc tray will pop out slightly. Plug the power cord into the back of the console. Press the eject button to open and close the disc drive. If the disc drive works properly, reattach the console faceplate. 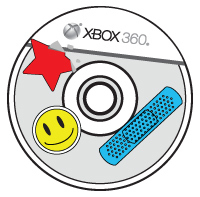 Would you like to contact Support regarding the "Manually eject your Xbox 360 console disc tray" issue you were reading about or a different issue?